Anders Zorn (1860-1920) was a Swedish painter, etcher and sculptor. Out from the Stockholm Academy in 1881, he traveled widely — London, Paris, the Balkans, Spain, Italy, USA. He made himself into an international success. Acclaimed at the 1900 Paris Universal Exhibition, he was awarded the French Legion of Honour. In Paris he was best buddies with Rodin. He kept moving and along the way painted three US Presidents. While his early works were often brilliant, luminous watercolours, by 1887 he had switched firmly to oils. Back in Mora in Sweden, married and settled, he built a home which is now a museum dedicated to him. 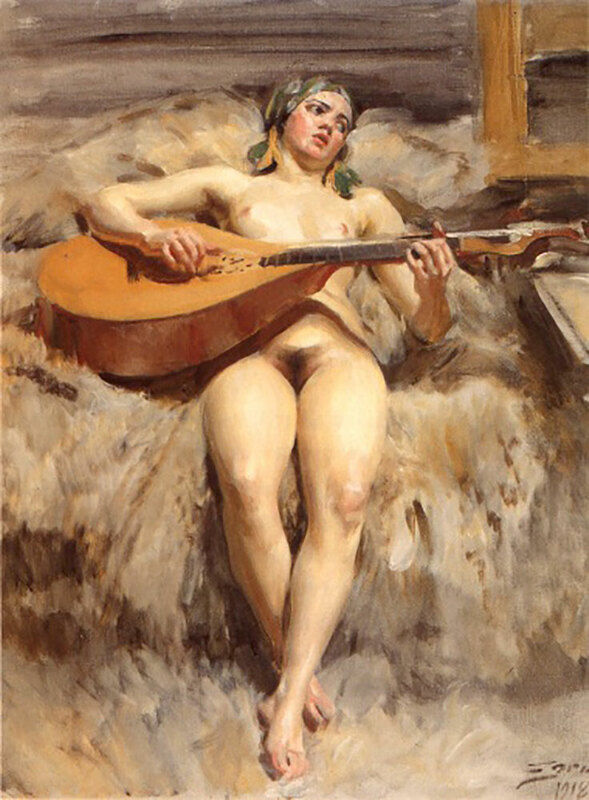 Zorn painted portraits, scenes depicting rustic life and customs and female nudes. These healthy and voluptuous girls are the works that have most endured. You can see them tucked away in many of the world’s great museums. They take your breath away. In Zorn you can see lush stroking and a brilliant understanding of warm and cool light, colour-loaded shade areas, sophisticated grays and reflected light. He built simple, bold, often monochromatic or analogous colour schemes in casual compositions. 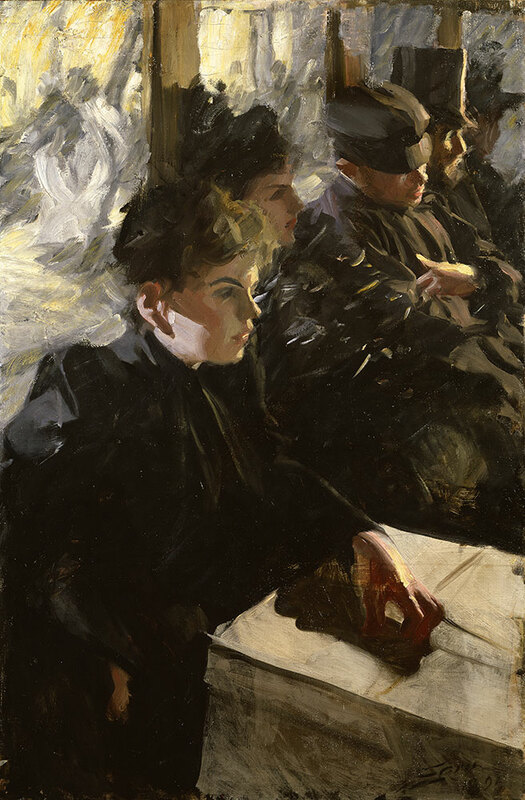 Like Sargent, he had an uncanny way of rendering what was before him, making it look hasty and flawless at the same time. Some of his decentralized and happenstance views have a decided “off-screen” look. “Not bad,” said my friend when I flashed him a few from my books. “What do you see in that?” he asked, pointing. I told him I thought Zorn’s work was full of wisdom. “I guess to a guy like you it’s a living, breathing education,” he said. I agreed. “Mannerist,” he said. It was a word he knew. This letter was originally published as “Anders Zorn” on February 22, 2005. We have a signed Zorn etching that my mother used to have in her closet. The two naked figures walking into the sea always makes me think of my parents – I think they felt the same. He caught a lifelong story in a single moment …. I went to the Zorn museum last year in Sweden, as well as having seen his house the previous summer. His work does take my breath away. He inspires one to always put the human figure in a painting. I’m not quite there. Zorn’s work is uncanny…thank you for this beautiful memory. Thanks for making me aware of Andres Zorn. 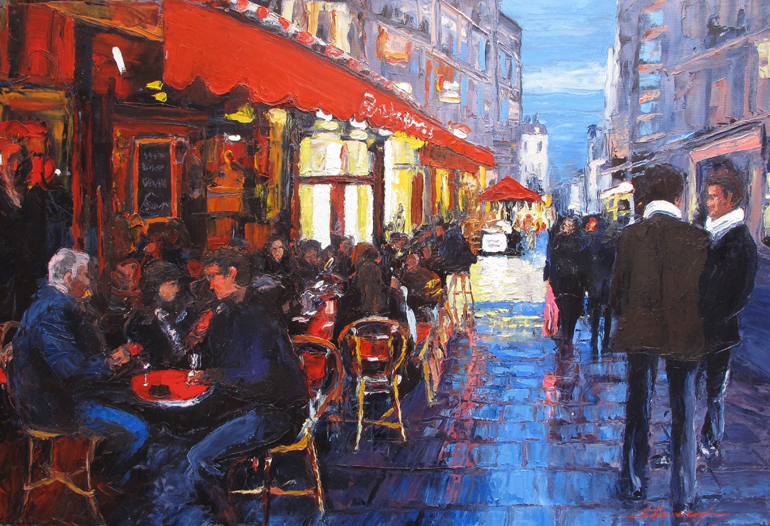 This is the style of painting I most admire, along with Schiele and Klimt. I find it interesting that the contemporary painters I most admire invariably mention three artists that most inspire them: Zorn, Sorolla and Sargent. It is easy to see why. Thank you for introducing me to a painter I do not know ……. but when I hear about his ability with light and sophisticated grays I am intrigued and will put him on my study list……. about the nose …… I set off an alarm last summer while putting my nose too close to a painting in a gallery in Australia….. the gallery guard said something similar- i.e. I have a good nose but it should stay attached to my body and not come in contact with the infrared alarms…….. he was very kind and I was a bit embarrassed…… I was allowed to take pictures that I could blow up to see the details I wanted to study ….. I have known about Zorn since I was a little girl. My mother spoke so highly of how he was able to paint especially skin and water. His portraits of royalties in Sweden are outstanding. I am Swedish myself and thus have had many opportunities to see his work when in Sweden. He painted with a limited pallet, also called a Zorn pallet. It consists of yellow ochre, cadmium red, mars black and white. He was a ‘master mixer’ of these colours of course. I am using this pallet since several years and find it very interesting that you can paint almost anything using only these colours. I would like to know how one could paint without a BLue? how would you arrive at green? thank you for any clues. 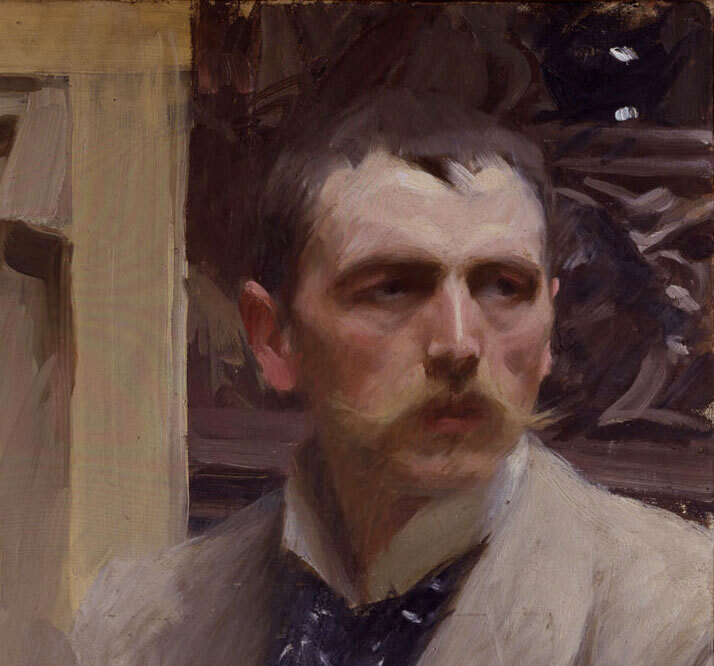 Although Zorn did not always use his limited palette, where he did, the blues and greens were not saturated. When some blacks are mixed with white they appear blue. With a touch of yellow that blue would look green. When sitting beside the right colors they would appear even more green or blue. One gets a very nice green by mixing yellow ochre, mars black and white. Olive greens depending on proportions. 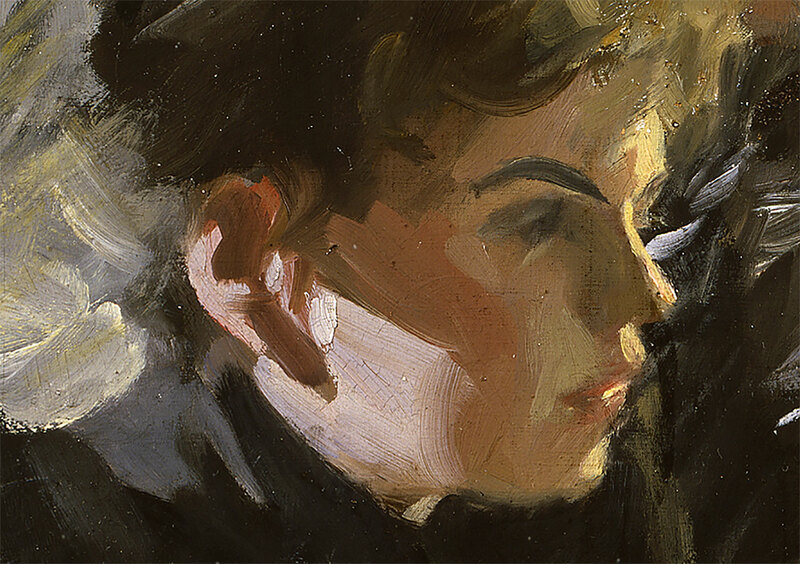 Zorn used other colours at times but most of his portraits are painted with the limited pallet. In his painting called Caique Oarsman from 1886, he used blue but in a very pale way. In the painting Summer Vacation both sky and water contains no blue (a strip of cobolt to right, I think) and it is so accurate in colours and so beautiful. The Thorn Bush from the same year is very green and blue, so he was not strictly using the limited pallet. What a master painter he was! I LOVE Zorn’s work. I believe Zorn’s palette was Ivory Black (lends to the blue side) not Mars black (which is a warmer black). The ‘bluish’ black was helpful with his yellow ochre to get the greens. And I did read he may have used other colors at times. He has a self portrait holding his palette showing his ‘limited’ colors. The Show of his work at the Legion of Honor a few years back was truly amazing! Can you tell me more about “off screen” look? What is it?